If you’ve been searching for a crossover SUV that can offer you and your family the versatility, capability and comfort you need every day, you’ve just found the perfect model. 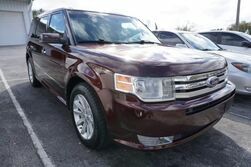 A used Ford Flex in Tampa, FL has all the qualities you are looking for in a vehicle and a whole lot more. The Ford Flex is a large crossover SUV with a wagon-like style that has three rows of seating and enough interior space to seat up to seven passengers while still giving you a lot of cargo space. Later model years, like a used 2017 Ford Flex have a lot to offer, including excellent versatility and capability. With multiple trim levels to choose from, you’ll also have no problem getting the interior technology features, luxurious comfort options and advanced safety equipment you’ve always wanted in a crossover SUV. The spacious interior and massive cargo area of a Ford Flex helps make it an easy pick for a used crossover SUV. 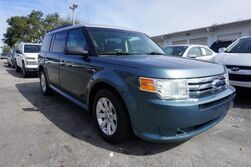 With three rows of seating and a highly versatile interior, a used Ford Flex in Tampa, FL has just what drivers are looking for to help make their daily drives more convenient and easier. A used Ford Flex can carry up to seven passengers comfortably and offers an incredibly generous amount of cargo space. When folding the second- and third-row seats down in a used Ford Flex, you’ll get up to 83.2 cu-ft of cargo space. Keeping the second-row seats up and folding down just the third-row seats will give you an impressive 43.2 cu-ft of cargo space while still be able to carry five passengers. Giving a used Ford Flex its impressive 4,500-pound towing capacity is a powerful turbocharged engine. The Ford Flex also offers available all-wheel drive in many of its trim levels, so you can get the traction control you need on slick road surfaces.